In the market for the best wall oven your money can buy? Finding honest and accurate wall oven reviews can be tough. To help with this, we have compiled the largest and most thorough list of wall oven reviews you will find anywhere on the internet. In this review, we list all of the top wall oven brands and break down our top picks based off of 7 metrics: Performance, Features, Product Selection, Looks, Durability, Price, and Overall Rating. We also discuss what exactly a wall oven is and how it differentiates from other types of ovens. For your convenience, we have listed the top picks in the table below. To read the more thorough review, just hop right below the table. It is easy to become overwhelmed when you look at just how many different wall oven manufacturers there are. But have no fear! We have scoured the internet and retail stores to list all of the major brands below for your convenience. 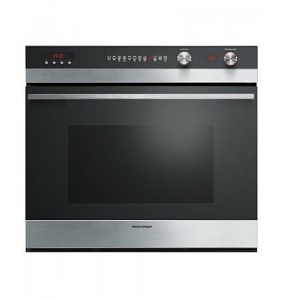 Blomberg is a smaller company that has a very limited variety of wall ovens. Specifically, they have a 24” electric and a 30” electric that come in a few different colors. Blomberg has decided to go for an extremely low price point but, obviously, you give up some of the more advanced and exotic features and styling accessories in doing so. However, they are still confident that their products offer up enough performance and cooking ability to be a viable purchase for those that don’t want to spend a lot to equip their kitchen. For those who are not familiar with Bosch, they manufacture several different home appliances including ovens, microwaves, dishwashers, refrigerators, and more. In regards to their wall ovens, they have a huge selection that spans across traditional configurations such as single oven, double oven, and combination oven but they also offer up selections in steam ovens and what they call speed ovens. Similar to many other brands they offer up three tiers of wall ovens. These are the Benchmark Series, the 800 series, and the 500 series. The Benchmark series is their premier line and has the most features, performance, and price. The 800 series is a middle ground for those who are still after lots of features but don’t want to pay the absolute top dollar. The 500 series is for those who are on a much tighter budget and are willing to sacrifice some features and performance to save some money. Cosmo Kitchen is a smaller company that has a very limited selection of wall ovens that are mostly intended for people on a tight budget. Specifically, they offer up two different sizes (24” and 30”) and both are electric. The only difference between the two models of a given size is in their color. Cosmo Kitchen believes that their wall ovens offer up a nice compromise between being very affordable but still offering enough performance and features to make most people happy. Dacor is a smaller company that is trying to compete in the premium price tier with their unique wall ovens. They come in single and double wall oven configurations and are segmented into three different tiers: Discovery iQ, Renaissance, and Distinctive. Each of these tiers provides unique pros and cons as well as price points. There are some really unique approaches that Dacor takes to try to justify their high asking price. But the big question: are the features and performance worth the high asking price or not? Electrolux is one of the lesser-known brands that we have come across that make wall ovens. However, don’t let their relatively unknown stature fool you. They do offer several different categories of products including various appliances in the kitchen, laundry, and cleaning items such as vacuums as well. As for their wall ovens, they have all of the typical configurations we like to see including single wall ovens, double wall ovens, and combination wall ovens. Unlike many other brands, they stick to a single tier of wall ovens with the primary difference within a given type being the oven size and how you communicate with the control panel. Empava is one of the smallest companies that make wall ovens that we are reviewing. This is also reflected in their product lineup which is quite small at only offering up 4 products. In addition, all 4 products are very similar to each other, with two of the four being identical other than the color. Empava wall ovens are designed for those on a very tight budget who don’t need a large, powerful wall ovens that are loaded with features. They are also a bit on the small side which can be a good thing if you are after something that can fit in a small space. All of their wall ovens are powered be traditional electric heating elements. 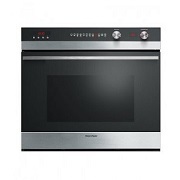 Fagor is one of the smaller companies that we are looking at and their small stature is reflective in their very limited selection of wall ovens. Specifically, they only offer single-oven wall ovens and all four of their ovens are electric. However, they do have a bit of variety in how their single wall ovens are set up. They actually offer right and left side-door wall ovens which are something we don’t see very often. They are targeting those who are on a tight budget and either can’t or don’t want to spend the high asking price that many other products on the market demand. We had honestly never heard of Fisher & Paykel before writing this enormous wall oven review. But in delivering you the best content on the internet we are exposing ourselves to some new products as well! Fisher & Paykel produce kitchen and laundry products with their wall oven units being somewhat limited to just 6 products that are single and double oven configurations. They have priced themselves to compete with other mid-range to premium-range brands and believe that they offer a product that helps them stand out from this very congested price range. Frigidaire is one of the biggest brands that make wall ovens and most people will immediately recognize their name. They have one of the larger collections of wall ovens on the market and they are available in both gas and electric varieties. There are a number of sub-classes that break up their products and each collection comes with its own special features and specifications. GE is another one of the “heavy hitters” in the wall oven world. Their products span a vast range of categories and you can bet that if you are looking for just about anything electronic for your home that GE likely has some offerings for you to check out. They have probably the most vast and diverse range of wall ovens of anybody in the industry (you can check out our model list below to get an idea of just how huge it is). They come in single wall ovens, double wall ovens, combination ovens, and GE’s patented Advantium ovens. Jenn-Air specializes in premium-tier wall ovens. They are a bit unique in that most of their products are double or combination wall ovens instead of singles (although they do still have a few single choices as well). They also stand out in that they offer three different types of convection: V2 vertical dual fan, multimode, and steam combination. Their asking prices are rather high but they feel that they have enough helpful features and the cooking ability to justify them. Kitchenaid is one of the best-known brands in our review competition. People are used to hearing their name across many facets of home appliances. They don’t disappoint with their large range of wall ovens that come in many shapes and sizes. This includes single wall ovens, double wall ovens, and combination wall ovens. And within each of these, they offer multiple types of convection technology, with their trademarked “Even-Heat” Technology taking center stage and being offered in multiple configurations itself. Out of all of the brands we have reviewed, LG is arguably one of the broadest and most well-known. If anything, they are most notorious for their TVs but they do have plenty of kitchen appliances to choose from as well. The LG wall oven category consists of 9 different units that come in single and double wall oven configurations. Unlike many other brands, they don’t add a lot of variety in regards to having a lot of different tiers or even a very diverse range of oven sizes to choose from. The main differences lie between their standard line and their “LG Studio” models which most has to do with aesthetic changes. Instead of offering a huge variety, LG hopes that their established reputation and their standard mid to upper-range price point will attract buyers to their wall oven products. We personally are more familiar with Maytag for their laundry appliances but they do also offer a wide variety of kitchen good as well. 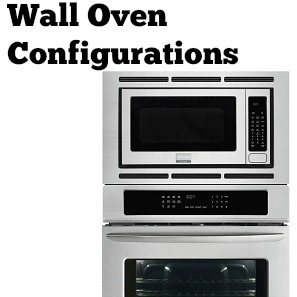 In regards to their wall oven lineup, they have single, double, and combination wall ovens. While there aren’t a ton of choices, they do offer a standard 27” and 30” in each which should still fill the needs of most people. Also, they all come standard with convection technology. Smeg is another brand that has a host of kitchen-related items but one of their largest selling products areas are the Smeg wall ovens. It is a relatively small range to choose from but they do offer single, double, and combination wall ovens. In addition, despite being a small selection size, there are both electric as well as steam-based units. Smeg tries to stand out from the competition by offering a product that performs will but also has very unique styling that really stands out among the crowd. Summit is a company that makes appliances mostly centered around the kitchen, including things such as refrigerators, freezers, beer storage, and of course ovens. The Summit wall oven selection is somewhat sparse, only containing a handful of models that all come in a single-oven format. They do add a bit of variety in that they offer both electric and gas options. From a price perspective, they are trying to compete with the low-cost, entry-level brands in the industry so their units will be a bit lacking in performance and features but be within most people’s desired price ranges. Thermador is one of the premier wall oven companies in the business. They are targeted to those who want the very best and are willing to spend a rather large sum of money to get it. There are several brands that offer up a more diverse product selection but Thermador still makes sure to give choices in all of the popular configurations including single, double, and combination. In addition to this, they stand out a bit further in that they also have some steam wall ovens and a very unique triple combination oven which is the only type of its kind that we have come across. They offer two different tiers for a given product type: their Masterpiece Series and their Professional Series. For those who are not familiar with Verona, it is a lineup of appliances that are based out of Venice, Italy and sold in the USA through EuroChef USA. The big selling point that they try to push is that these are European-inspired products that you can now purchase here in your own backyard. You have a choice between 24” and 30” sizes with all but one of them being a single unit (with the one exception being a double unit). While there aren’t as many product choices as other brands, there is quite a bit of variety in the level of power and Verona also offers gas-powered and 100 Volt options as well. 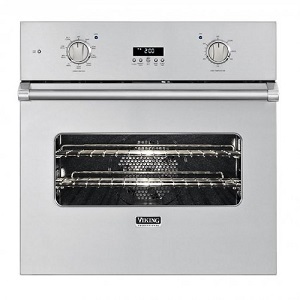 Viking is one of the most popular premium-level wall oven brands, and for good reason. They offer some fantastic products that can perform with the best out there, but it does come at an extremely expensive asking price. In regards to Viking wall ovens, you have to choose from three tiers: the 3 series, the professional 5 series, and the professional 7 series and you also have choices in both single and double oven layouts. In addition, they come in 27” and 30” sizes and in both gas and electric options. Just about everybody has heard of Whirlpool. If not for their wall ovens, many people associate them with the wide range of other products that they manufacture including washers, dryers, refrigerators, and more. In regards to their wall oven collection, it is by no means the largest but it does cover all of the standard categories such as single, double, and combination. While many other brands offer up three tiers (or more), Whirlpool has stuck to just two: their Gold line and their standard line. Their Gold line will have a few more features but also be a bit more expensive. So what goes into determining what the best wall oven is? We have created a list of metrics that we go by to help with this. We have listed and explain each of our metrics below. This metric encompasses how well (or poorly) a particular wall oven or wall oven brand does at cooking food. There are several variables that we consider but the most important are the power of the heating elements, the variety of heating elements, and the features that are in place to enhance and take advantage of those heating elements. We like to see wall ovens that have strong heat sources and also have the necessary accessories in place to make the most of the heat. Everybody loves features and that is no different here. We look for wall ovens that have plenty of helpful features that can make using them much easier and more effective. This can be both mechanical features such as temperature probes, rolling racks, and safety switches and also electronic features such as advanced cooking settings, interactive LED displays, and customizable user interfaces. Product selection deals with the variety of products a particular brand has on the market. Believe it or not, there is a huge range of wall oven types (which we discuss in more detail below). We like to see multiple offerings being brought to the table that has a nice variety to them so as to appeal to the largest target audience. Specifically, we look for having various wall oven configurations such as single ovens, double ovens, and combination ovens. In addition, having multiple heat sources such as electric and steam is a huge bonus as well. Looks do play an important role in shopping around for the best wall oven for you. Since the oven is one of the most exposed and seen appliances in the kitchen you want something that looks nice. Obviously looks are quite subjective but we have found that certain brands give off a more “high-quality” feel than others and do a better job of making something that you would be proud to display in your kitchen for everyone to see. Wall ovens can be very expensive and as such are considered more of an investment than a simple purchase. When you are potentially dropping thousands of dollars on something you want it to last for a long time. Durability considers how reliable a unit is towards typical wear and tear that it will experience in a typical kitchen. We look for noticeable issues that have been prevalent among a brand. As always, price plays a huge role in considering what the best wall oven is for you. And wall ovens can vary greatly in their price, starting from bargain brands that can be had new in 3 figures and go up to premium lines that can flirt with 5-figures. Just because a wall oven happens to be more expensive than another doesn’t automatically mean it will have a worse rating here. Rather, we consider everything that if offers and compare that to its asking price. If it has a lot to offer for its price then it will score well here. 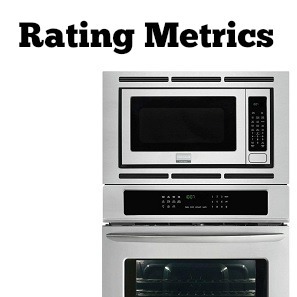 The overall rating is what it sounds like: an overall rating of how well a wall oven brand does among all categories. It considers all of the other metrics mentioned above and it allows us to offer up a good idea about how “good” or “bad” a particular oven is. We like to go for products that score 3.5 or above (and we are picky in our ratings) but just because something happens to be below 3.5 doesn’t mean that it might not be the best option for you or your houseold. Because of this, we encourage you to read up on all of the wall oven reviews you might be interested in and come to the best solution for your needs. 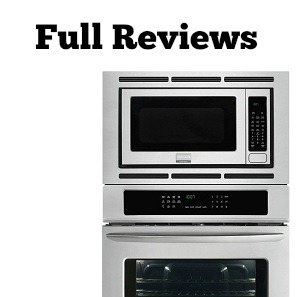 These are our full reviews for each wall oven brand. We break down all of the rating metrics mentioned above and go specific ratings to each one. Blomberg doesn’t display what their cooking output is in terms of wattage but they are powered from a standard 120 to 240V AC power supply. The fact that these are budget and the actual element specifics aren’t included make us assume that it isn’t anything impressive, and that fact that we have heard from multiple sources that items can take a bit longer to cook in these further supports that. There also aren’t much in terms of cooking features and even the almost standard convection capability is lacking here. Bomberg really was going for budget bare-bones here and it is reflected. Basically, if you plan on cooking a lot of large items at once you may quickly run into issues with there simply not being enough heat to go around. There really aren’t many features to get excited about here. The only ones really worth mentioning are the self-clean capabilities, the automatic door latch, and the included cooking fan. There is little in the way of cooking modes or any sort of in-depth cooking feature that gives the user more control. Also missing are other convenience-oriented features such as rolling tracks, temperature probes, etc. We understand that these types of things cost money and would ultimately drive up the price but we would actually be willing to pay a bit more to have the essential features. Your choice of products is very limited here. As mentioned above, you basically have two models to choose from that come in a couple of colors and that is about it. And both of these models are single oven, electric powered, and with relatively low-performance capabilities. Those who prefer double or combination wall ovens will be out of luck as will people who want steam wall ovens. This is a major concern as Blomberg has severely diluted down its target audience. These are very standard in appearance and it is obvious that they are budget items. You are stuck with bulky mechanical knobs and buttons instead of touch screens or built-in buttons. The display is very cheap and doesn’t convey a sense of quality. Even the inside cavity looks to be of subpar quality with its flimsy racks and tiny fan. At least you have a little bit of flexibility when it comes to color options. Being a very simple unit here actually has its perks. There aren’t a lot of electronic features moving components so there isn’t a lot that can go wrong. However, there are some minor fit and finish issues that are common with budget items but for the most part they don’t affect performance. The only minor concern we have heard is that the self-cleaning feature can sometimes cause things to overheat but it doesn’t appear to be a common thing. 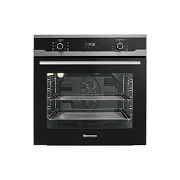 Easily the biggest selling point of Blomberg wall ovens is its great price. These are one of the, if not the most affordable wall ovens will you find anywhere. This is thanks to a combination of being only single, electric ovens which are typically the most affordable as well as having little in regards to features or additional accessories. For those looking to spend the absolute bare minimum for a wall oven, Blomberg will be on the short list of what is available. The Blomberg wall ovens are literally as bare-bones as you can get. Their performance is lackluster, their features are sparse, and their looks leave a lot to be desired. There are also only a couple real options to look at and they are both very similar. However, where it does shine is in its extremely low price. We understand that some people simply can’t afford the high asking price that many wall ovens demand and will have to look at these types of products. And we can say that the Blomberg units do work and are relatively reliable. However, for anybody who can spend even a few hundred extra dollars we recommend shopping around as there are much better wall ovens available for a little more. As mentioned above, there are quite a few different tiers of Bosch wall ovens so we will go over each. Surprisingly, all three of their primary tiers (The Benchmark Series, the 800 Series, and the 500 series) come with the same oven power specifications. Specifically, each has 2400W for baking, 3800W for broiling, and 2000W for convection. This is actually on the average if not slightly below average side compared to other brands, but Bosch makes up for it with their features. All three classes have multiple cooking modes, starting with 11 for the 500 series and going all the way up to 14 for the Benchmark series. Bosch also advertises that they are very efficient and that their ovens do a great job of containing heat. In other words, you can get the same if not better cooking performance while requiring less energy (which means lower energy costs). This is further reflected in their special modes such as EcoChef, which uses the remaining heat in the oven cavity to finish the cooking process. As expected, their HSLP451UC steam oven uses steam convection for its cooking ability. This results in crispier meals and is great for vegetables. And their speed oven combines the cooking qualities of a traditional convection oven with the speed and convenience of microwave technology. This allows for super fast cook times but not the soggy mess that traditional microwaves can create on food. We do appreciate all of these great features. Our one complaint is that the convection ovens don’t do a very good job of containing and removing heat. The blower tends to blow the hot air from inside the oven back towards the front. This can mean that in front of and around the oven can become extremely warm during operation and make things uncomfortable. We love the diverse array of features that the Bosch wall ovens present us. Even in their budget line, the 500 series, there are still more features than most people would expect or even need. Helpful features include things such as an AutoProbe to take the guesswork out of cooking meats, EcoChef mode, temperature conversion, double-digit cooking modes in all models, custom cooking programs, extra fast preheat mode, and much more. And just as importantly, these features are rather easy to use and just about everybody should be comfortable with them after a short period of time. Bosch wall ovens are among some of the most diverse in the industry, and you have a huge range of both sizes and types to choose from. They are one of the few that offer up steam ovens and even their traditional ovens come in three different tiers that have varying door sizes. Color options are somewhat lacking in that there is only brushed silver and black but this is a minor inconvenience and easily overlooked when you see how many products you have to choose from. These are very classy in appearance and give off the feeling of being a premium product that will compliment any kitchen. The colors, while limited, both are done quite well and the black trimming really meshes well with the brushed silver. We also appreciate the oversized LED display that makes these products feel much newer and modern. Even the lowest class, the 500 series, still feels high-end and you don’t feel like you are having to sacrifice things in the looks department to save some money. Overall the toughness of these wall ovens isn’t bad but there are a few issues that seem to pop up more often than we like. The biggest one has to do with the electrical components. There have been a lot of reports of there being an electrical short relatively early on which requires a repair. If you are outside of the year warranty this repair can be quite costly. Essentially, there are a lot of components and electrical features on these units and while that is welcome when they work, that also means that there are more places where there can be an issue or malfunction and there really isn’t an easy or cheap fix for any of them outside of warranty. But as for the physical metal and plastic components, they fit together quite well and should be able to take the standard wear and tear. Bosch wall ovens aren’t cheap and will be firmly in the mid-range to premium-range depending on which unit you are looking at. In fact, their Benchmark series is among some of the most expensive wall ovens in the industry. You do get a very attractive product that has plenty of features and accessories and adequate performance but for some, the asking price will simply be too high and the need for all of those extra features is not high enough to warrant such a large purchase. 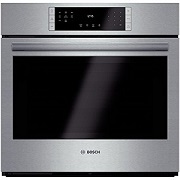 Bosch definitely brings a refreshing and unique approach to wall ovens with their product selection. Not only is there plenty to choose from, but they also branch out of the traditional types and into specialty ovens such as steam ovens, speed ovens, and side-door ovens. As for performance, you won’t be amazed by the power output but Bosch believes that their helpful features and efficiency more than make up for that. The only complaints we have is that there are some electrical gremlins and the price tag might be higher than some want. But if you are able to spend that kind of money and feel that the really neat features are something you would take advantage of then we recommend giving Bosch wall ovens a closer look. The power outputs of these units are 2460W and 3000W for the 24” and 30” wall ovens, respectively. Compared to the rest of the industry this is definitely on the lower side. This means that you might find yourself having to cook items longer than you like to properly finish them and that you will definitely see some struggles when attempting to load up the oven cavity with multiple items at one time. We do like that there are a variety of pre-selected cooking functions that can help make the most of the limited power that the Cosmo Kitchen wall ovens offer. Specifically, the 24” models have 10 functions and the 30” models have 9 functions. Examples of some of the modes include convection, grill mode, baking, pizza mode, and more. You won’t find nearly as many features on these models as you will on higher-end, most expensive products on the market. Things such as temperature probes, cooking profiles, and more advanced multi-level cooking methods are nowhere to be seen. However, both wall ovens do offer convection and self-cleaning which we like to see. They also have digital readouts which a lot of budget models that we have come across fail to have. As you might have already noticed, Cosmo Kitchen is very limited in their selection of wall ovens. There are only two models that come in two different color choices, and both models operate very similarly except for their size. And both being budget units mean that they are on the weak side so anybody who is wanting something more powerful that can handle larger food challenges will be out of luck. In addition, this is one of the few companies that we have come across that don’t make any sort of double wall oven or combination oven. All they have to offer are single ovens so people who are looking for different configurations will also be out of luck and be forced to look elsewhere. For the price, these wall ovens aren’t terrible looking. They come in the tried and true black and brushed silver color combination that we often see. The screens, while digital, are a bit on the cheap side and more resemble something you would see on a mid-90s alarm clock than on a high-end kitchen appliance. Also, the knobs that they use do not feel very solid and give off the feel of cheap plastic to us. We understand that with these low price points one cannot be too picky about aesthetics but little things such as premium knobs are a bit higher-definition digital read out can really do a lot in regards to overall appearance. We are actually happy to report that these products seem to hold up pretty well over time. This is often not the case with budget kitchen appliances but the combination of a simple design and what we assume is good manufacturing processes results in an oven that should last for several years without any major issues. The self-cleaning feature can sometimes be a bit hit-or-miss but overall we are very impressed with Cosmo Kitchen’s wall ovens’ durability. Easily the biggest selling point of these products is in their asking price. They will be among the most affordable you will find. And for the price, you still get a product that puts out enough power for most people and that should last for quite a while. 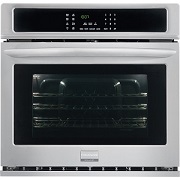 This makes these great for someone starting out and simply looking for a serviceable oven to take care of them for a few years while they establish themselves. Yes, you are giving up a lot of features and will have to deal with some cheap-looking components but for this price, you can swallow these negatives. Cosmo Kitchen wall ovens are definitely lacking in selection and size and the performance might not be enough for some, but they do come in at a fantastic asking price. Combine this with their acceptable durability and you have a good starter wall oven. However, for everyone else (which will be most people), you will likely be looking for something with more features, better performance, and a higher-end look and you will be more than happy to pay a bit extra for these things. No matter which tier or size Dacor wall oven you go with, you will work with the same heating power. Specifically, you are looking at 2,200W convection and 3,500W broil. This is about average compared to the rest of the industry but that is only the beginning. Where these Dacor wall ovens really stand out is in their huge range of features that help with cooking performance. Depending on which specific product you go with you will get to enjoy various cool accessories. For instance, in the iQ series, you can take advantage of Dacor’s proprietary Discovery iQ technology. Essentially, this technology is there to make cooking as easy as possible through things such as guided cooking and tons of specific cooking modes to optimize your cooking process. This is on top of the 10 cooking modes that are programmed in such as pure convection, pure convection seat, convection bake, and more. If you go with one of the wall ovens from the Distinctive line, you can take advantage of Dacor’s exclusive four-part pure convection system that helps to distribute heat equally. In summary, these ovens are excellent at handling any cooking task you can throw at them. We are simply blown away by the number of features that these units have. They are one of the most impressive brands in terms of how much they have to offer. The thing that immediately will stand out to you is the full-color built-in electronic control panel on the Discovery iQ. It is actually a 7” LCD multi touch-screen monitor that is powered by the Android operating system. As for the Renaissance and Distinctive series, they have a more “traditional” display but it still comes with tons of button features. Other features that you will enjoy on these wall ovens include GreenClean Steam Cleaning technology, integrated WiFi and Bluetooth, up to 7 rack positions, multiple glide racks, SoftShut hinges, halogen lighting, digital temperature probe, and tons of cooking settings. And speaking of cooking settings, Dacor is also one of the few brands that offer a fully customizable mode that allows the user to save their favorite cooking settings, recipes, etc. And that is just a taste of what there is. Dacor really did out do themselves in this category. The choice of products from Dacor is decent. They offer both single and double wall oven configurations and we like that they have three different tiers of ovens that each have very unique selling points. That being said, we wish that there were some combination wall ovens to choose from and also some more affordable products for those on a tighter budget. It would also be nice to see some other energy sources such as gas or steam. However, for those with somewhat deep pocket books and what specifically a standard single or double layout then you have several choices. There is a very distinctive look for each tier that you go with. The highest tier, the Discovery iQ, looks the most attractive in our opinion. We love the inclusion of the 7” touch screen and it really makes the oven stand out among the competition. The display on the Renaissance isn’t bad, either. The buttons are illuminated in an attractive way and it brings the entire product together in a nice way. However, we feel that the Distinctive series has a noticeable bump down in terms of the appearance of the display panel. The LED display is somewhat low resolution and we feel that there are simply too many words on the buttons and it gives a cluttered look. Outside of the display panel area, all three models come in an attractive brushed silver color and the various components have a high-quality look to them. Despite the many advanced features and overall complexity of these units, they do a pretty good job in the reliability department. You can tell that Dacor put a lot of thought into the design and implementation of each component and they didn’t take any shortcuts. The end result is a lineup that should last for several years without issues. Just keep in mind that if things do go awry, repair costs can be substantial due to the complexity of these wall ovens. Dacor wall ovens are among some of the most expensive in the industry. If you are on a tight budget or even semi-tighter budget they likely will be out of your price range by a pretty big margin. There is a bit of a gap between their lowest tier models and their highest tier but even their “budget” offerings are well above what most of the other ovens in the industry fetch. However, you do get a ton of features, great performance, and acceptable durability if you can manage to pay the high asking price. Dacor really brings some unique products to the table and make a viable argument for looking into them if you are after a premium-level wall oven. The features that they offer are simply unparalleled by just about every other brand and their cooking performance and cooking features are equally impressive. We love the looks of the Discovery iQ lineup and while we aren’t as in love with the lower-end models they are by no means ugly. Our only gripe (other than the high price) is that Dacor has someone polarized their target audience down to those with the deepest pockets. But for those with the deep pockets, you won’t be disappointed if you decide to go with one of these excellent wall ovens. Wattage for these units is standard across all models. You will enjoy 2,000 watts for baking, 2,500 watts for convection, and 4,000 watts for broiling. We have a bit of a mixed feeling about these values. The 4,000-watt broiler is among some of the highest in the industry and the convection values are above average as well. However, we are a bit disappointed in the decision to just go with 2,000 watts for baking, particularly considering that baking is typically one of the most common uses for a wall oven. That being said, there are enough cooking features that make this issue easy to overlook. In fact, we suspect that Electrolux found out that they only needed 2,000 watts to adequately cook thanks to all of these other cooking features as well. These include things such as their trademarked Perfect Taste convection system and temperature probe as well as a multitude of baking options including dehydrate, bread-proof, rapid preheat and more. As mentioned in the performance section above, there are more than enough features related directly to cooking. However, it doesn’t end there. Other helpful ones include the interactive digital display that is loaded with customizations that should make just about everyone happy. One thing that we really like and that we wish other models would pick up on is the inclusion of a “favorites” menu that allows you to store a setting that you often use. Electrolux wall ovens also come with hidden bake elements that assist with cleanup as well as multiple cleaning options. Automatic door locks, luxury-glide oven racks, and many other features add to this impressive list. While you do see products from each of the popular configurations, there isn’t a lot of variety beyond that. 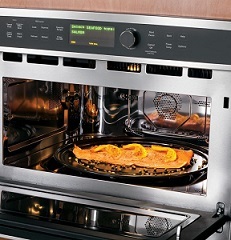 You can only choose from electric-based ovens and all power outputs are identical for a given size. The major difference is in the oven size (which is a subtle change at best) and the choice between IQ-Touch and Wave-Touch controls. In the future, we would like to see more variety from Electrolux in regards to sizes, power outputs, and power sources. We love the styling of these wall ovens. The combination of the brushed metal outside and the dark window really works for us. And the digital display is one of our favorite in the industry. One common complaint that we hear is when all of the buttons and knobs are always lit up. This can make the wall oven stand out too much from the wall and really take away from the rest of the kitchen. With their Wave-Touch controls, all of the control panel buttons are hidden until you simply wave your hand over them. This makes them light up in a very pleasant white tone. We have heard several minor issues associated with these products, mostly in regards to the hidden bake element and the control board. One issue with the more complex panels is that while they are helpful when they work, it also means that there are more areas that things can go wrong at. Specifically, you need to keep an eye out on the relay of the control board as it has been known to have issues after a short period of time. Beyond the electrical issues and the hidden bake element, the rest of the unit is assembled nicely and quality materials are used. Electrolux wall ovens are definitely not budget products. They will typically fall in the premium-level tier compared to the competition. While there are more expensive units out there, you are definitely approaching the top of the price bracket. Now the big question: is the high price justified? Performance is adequate and you get tons of features. And it definitely looks the part of a premium wall oven. Our only doubt is with the durability issues. It is very frustrating buying such an expensive product for it to break after a short period of time. Electrolux wall ovens don’t have the largest or most diverse range of products but they do cover most of the bases. We like the controls, the features, the looks, and the performance isn’t too bad, either. But as mentioned above the price is quite high and we have heard a few too many complaints about reliability to ignore them. We don’t want to scare you off from Electrolux products because when they are working they can keep up with the best, but you might want to look into purchasing an extended warranty or making sure that the common quality issues are taken care of before you make a purchase. These products won’t perform as well in regards to raw heading ability as a lot of other wall ovens on the market. This is because of their relatively small power capacity which simply isn’t as powerful as we are used to seeing. In the larger two models, you will work with a 2800 watt source that thankfully comes with convection ability. And in the smaller two sizes, you are downgraded to a relatively weak 2000 watt capacity and also give up convection cooking ability. This is also coupled with a 2.3 cubic foot storage capacity which is much smaller than most other products on the market. What all of this means is that if you plan on cooking a lot of items be expected to be challenged with space concerns. In addition, cooking times could increase some and you might also have to deal with inconsistent cooking rates depending on the location and type of food being cooked. All GLI products are constructed of premium polyethylene or polypropylene material that is either solid or in weave format. These materials are quite light while still quite strong and puncture resistant. In regards to their winter covers, the fabric is very light which means it is easy to handle but might not be as strong as some would hope. Features that help to assist in strength include hold-tite reinforced seams, double-folded self-edges, PVC coatings, and tighter mesh than much of the competition. It goes without saying that the product choices here are severely lacking. You only have four to choose from and since two are essentially identical, your options are really limited to three. And of those three options, all put out very similar heating performance and have near identical storage volume. The decision to do this really limits the target audience that Empava can aim for and basically anybody who is looking for a mid or high-level wall oven with more than the bare essentials will be out of luck here. Also, people who prefer non-traditional cooking sources such as gas or steam will not have any products to choose from, either. The appearance of these products isn’t actually all that bad. They are very progressive and the brushed metal handles and accent pieces really stand out. They also come in rather unique colors such as light blue and red. However, they are severely lacking in the display department, with the bottom two not even having any sort of LED or even analog display. And the LED display that is included in the KQ65C-17 is not anything to get excited about (but at least it has one). But overall for the price you have to pay they look more than acceptable. Despite being a budget list of wall ovens, they are surprisingly resilient and should hold up to most standard usage. The fact that they are very simple in design and don’t have a lot of features likely helps here as there are simply fewer places that things can go wrong. Our only minor complaint is that the knobs used feel a bit on the cheap side and the paint can wear down after some usage. While this doesn’t affect performance or function, it definitely doesn’t help in the looks department. 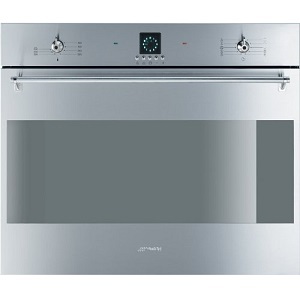 The biggest positive that will jump out to most people that look into an Empava wall oven is the great price. These are among the most affordable wall ovens you will find anywhere. This means that they should fall into just about everyone’s budget, no matter how small it may be. Yes, you make some sacrifices in regards to performance, size, and features but we feel that the great price makes up for that. For people looking for a simple, cheap cooking solution at a great price, Empava definitely offers up a good solution. If you decide to go with an Empava wall oven you are going to have to deal with very few product choices, limited performance, and limited capacity. However, you are going to be able to purchase a wall oven for an extremely affordable price which helps make overlooking the issues a little easier. You also will get to enjoy a product that is quite reliable despite its low price tag which is a bit of a rarity for budget appliances. If you want more than bare-bones we encourage you to look elsewhere but if saving money is a top priority then you may consider checking out Empava wall ovens. The performance numbers on the largest Fagor unit actually isn’t bad at all despite being somewhat of a budget wall oven. Their largest size, the 30”, comes with around 3,600W of total power. Specifically, this is divided up into around 3,500W for its broiler, 2,500W for its convection element, and 3,000W for its traditional baking element. Their smaller size, the 24” single, provided similar total power but the broiler element is dropped to 2,600W, the convection is dropped to 2,100W, and the baking element has to settle with 1,500W. We are a bit disappointed in how much heating power the smaller units (which consist of 3 out of the 4 Fagor wall ovens) have, but again we can’t be too picky given the low asking price. Also, all 4 units come with convection capabilities standard which we really appreciate as convection heating can do “more with less” so it doesn’t require as high of raw heating power to be viable. Again, we are pleasantly surprised with just how many features these units have for their price. Standard offerings include gliding telescopic oven racks, preheat booster, multiple pre-configured cooking programs (bake, convection maxi-broil, turbo-plus, etc), digital display, and in the 30” model it also comes with a self-cleaning capability. There are a few somewhat common features that are missing such as temperature probes and more intricate temperature and cooking monitoring features but we are more than content with what we have to work with. We are somewhat disappointed in the very limited choice of Fagor wall ovens to choose from. There are only four and all come in a single-oven format. In addition, all four are electric so those who are after a gas or steam oven or someone who wants a microwave will be out of luck. At least there is some variety in how their single ovens are laid out. They come in a small 24” cavity and a much larger 30” cavity. In addition, Fagor is one of the few brands on the market to offer right and left-opening side doors on their models. We have seen people actually purchase one of each and place them side by side on a wall to make a very stylish display and somewhat work around their not being a true double wall oven choice. These are budget products and you are somewhat reminded of that when you see them. They don’t give off that “premium” feel that more expensive products do. The display, while digital, resembles something you would find on a cheap alarm clock. And Fagor has used standard mechanical knobs and buttons instead of going with the touch display. In our opinion, this is a more aged look and may stick out some when surrounded by more progressive appliances in a kitchen. There are several noticeable shortcuts that were taken to meet the low price point. The components used are simply not as high of quality as we like to see. The hardware and metal pieces are cheap and flimsy and will not hold up to the wear and tear you would hope for. In addition, there are some electrical challenges associated with the digital screen where it may have difficulty turning on. Finally, and most importantly, the Fagor customer service and repair department is extremely difficult to get a hold of which can make chasing down and fixing an issue an absolute nightmare. We recommend that you have someone you know that is very good with diagnosing and repairing wall ovens (or perhaps learn the ins and outs yourself) if you want to buy a Fagor wall oven with a clear mind. There is no other way to put it. These wall ovens are extremely affordable. In fact, they are some of the most affordable you will find anywhere. Given the extremely low price, we can’t be too picky, and we actually are pleasantly surprised with some of the pros of these products. However, you can really tell that it is a budget item when it comes to the looks and build quality. Fagor does a few things well with their wall ovens and also does a few things very poorly. Starting with the positive, they are extremely affordable and actually do a pretty good job in the heating department. In addition, they come with a lot more features than many people would expect given the asking price. That being said, they don’t come without their major concerns. Lack of product choices is obvious and will turn people away immediately who are looking for double wall ovens, combination wall ovens, gas wall ovens, or a plethora of other products that Fagor simply doesn’t carry. In addition, the looks are questionable at best and there are some major concerns with reliability. And finally, it can be very difficult to get the proper support you need to chase down a problem when it does occur with a unit. For those on an extremely tight kitchen budget, it might be tempting to gamble on one of these products but we recommend saving up for a little while longer and going with something with a more proven track record. Broiling performance comes in at 3,000W on Fisher & Paykel’s 24” wall oven and is bumped up to an impressive 4,400W on their 30” ovens. This is some of the higher numbers we have come across and means that these products pack some serious heating punch. On the 24” model convection also comes standard and on the 30” model you get to enjoy what Fisher & Paykel call their Aerotech cooking system. This trademarked system is advertised as being able to provide even heat distribution throughout the entire oven cavity which helps to ensure for a more consistent cook across the entire item. Beyond this, there are plenty of cooking modes that further help to ensure optimal cooking performance. While most of them revolve around various convection capabilities in the smaller (and cheaper) 24” models, if you upgrade to the larger model you will get to enjoy modes such as Aero Bake/Broil/Pastry, Maxi Broil, Classic Bake, and more. Most of the features you expect to see are present and there are also a few that help the Fisher & Paykel wall ovens to stand out from the competition. Standard in all units are things such as an advanced cooling system that minimizes how long the oven stays warm after cooking, self-cleaning, defrost, and removable oven doors and shelf runners. In the larger model, you also get to enjoy all of the Aerotech modes mentioned above as well as things such as a catalytic venting system, control panel key lock, audio feedback, CoolTouch door, multi-piece broil system, meat probe, and more. Product choices are a bit limited, with you only really getting to choose from 6. There is a separate warming tray that you can purchase but we doubt anybody would buy just this and skip out on the wall oven. For the wall ovens that are available, you have the choice of two doubles of different colors and 4 singles of 2 different colors. All but one example come in the 30” model with the sole exception coming in the much smaller 24” example. All of these products are the traditional electronic wall ovens that we are used to dealing with so people who want to go for a steam or gas oven will be out of luck. Another big thing missing with these units is a combination wall oven that comes with a microwave. Fisher & Paykel has managed to create a product that has some progressive cues but still sticks to the roots of what a traditional wall oven looks like. The first thing you may notice is that they have decided to stick with mechanical turn knobs instead of going to buttons like many other premium brands. Normally we might be turned off by this but they are able to pull it off in a way that gives it an almost classy look. Another thing you will quickly notice is that the layout of the buttons and digital readout are not in a normal configuration. The clock is placed on the far left side and the knobs placed on the far right side with the buttons in the middle. We are used to seeing the display being more centered. It is certainly a unique approach that some people might enjoy while others may be a bit turned off by it. 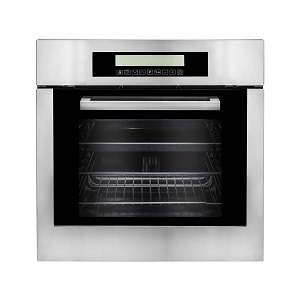 The body of the oven comes in a very sleek black and brushed silver color that they pull off quite well. Like many other more complex wall ovens that we have reviewed, these Fisher & Paykels are also similar in that there are a lot more electrical issues than one would hope for. The common theme revolves around there being issues with the self-cleaning working properly and the thermostat going out. Also, there can be quite a bit of difficulty in getting an official Fisher & Paykel technician out to actually look at and repair your wall oven. This means that you might have to find a third party who can work on it and it is unsure if they will be as familiar with the specifics. These units certainly aren’t cheap and are firmly placed in the mid to upper price range. The only reason we even mention middle is because of their 24” model but seeing how a majority of their products come with the 30” oven standard you should essentially consider this a premium brand (not to mention that the larger model is loaded with more features and all around a better product in our opinion). But for this high asking price, you do get to enjoy one of the most powerful heating elements in the industry as well as gobs and gobs of features and accessories. Fisher & Paykel wall ovens do a great job in several categories: their performance is awesome, their features are endless, and they have a refreshing look. However, they do come with a rather high price tag, the product choices are somewhat limited, and they are cursed with the same durability issues that we see time and time again with the more complex wall ovens. 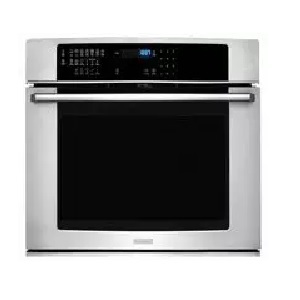 If you have someone who is familiar working on these products in the case that there is an issue after a year or two and you specifically want either a single or double wall oven and are willing to pay for the best then this isn’t a terrible buy. Frigidaire really tries to “do more with less”. We really see that on its bottom tier products as they attempt to compete with much more expensive models without sacrificing too much. Their base models will typically come with main oven bake power of around 2000 watts and broil power is bumped up to 3400 watts. On the higher end models such as what you will find with the professional series, you will enjoy a power increase of 2200 watts and 4000 watts on baking and broiling, respectively. As for Frigidaire’s gas ovens, you can expect a broil output of around 14,000 BTU which is about average if not slightly below average compared to the rest of the industry. But what does all of this mean in regards to performance? Well, the power output is fine for most applications. However, there are some issues with the convection feature not being as efficient as we would have hoped. This means that your bake times might end up being a bit longer than what you would have thought. This is mostly a problem with their lowest-tier offerings and if you decide to spend a bit extra and go with a Frigidaire Gallery or Professional model you shouldn’t be concerned. All of the standard features you would expect and need in a wall oven are here. You do give up some handy extras such as self-clean, convection conversion, dual timers, temperature probes, and a “favorites” menu built into the interface with the budget models but most people can make do without these. The one area we feel is lacking is for those who enjoy a higher level of customization with their wall ovens in regards to setting profiles and being able to manipulate settings. This is a common feature on many of the premium models on the market and it is a constant reminder to us that this is, in fact, targeted more towards people wanting to stay in the budget to mid-range tier. The selection of products is great and just about everybody should find something that works for them. As mentioned above, there are three tiers to choose from and within each tier you will have some flexibility in regards to door size and colors. Frigidaire offers choices in single wall ovens, double wall ovens, and combination wall ovens which we like to see. They even have a small selection of gas ovens which is can be somewhat of a rarity these days. About the only type of oven missing is a steam oven but this is the case for just about everybody. The appearance of these products is pretty standard if not a bit on the dull side. In all but the highest, professional-level FPEW307RF, FPET2785BF, and FPET3077RF models, the dials and user interface are a bit dated and the display screens are a bit on the small side. This is simply the sacrifice that one has to be willing to make to stay in a budget price tier. We do like that there are various color options to choose from including black, white, and stainless steel. We also wish Frigidaire would try out some more exotic layouts including side-opening doors which some other brands have begun to sell. This can really bump up the looks without significantly adding to the asking price. There are some minor quality control issues that have been reported, particularly in the lower-end models. The most common complaint has been with the microwave on the combination wall ovens. The microwave has been notorious for shorting and ceasing operation very early on. This is likely due to a wiring error and will require having someone fix or replace the unit. There have also been a few issues with the glass not staying properly fixed on the door. Probably the biggest complaint we have received is with the fans. The fans used on these wall ovens are extremely loud and some also make a banging noise while spinning. This can be very annoying and we suspect that banging noise will also come with a reduction in fan life in the long run. In our opinion, Frigidaire’s biggest selling point come thanks to its very competitive asking price without sacrificing too much in the performance of features department. For those on a tight budget, they have a large selection of both single and double wall ovens that should meet most of your needs. For those willing to spend a bit extra or are after a higher-caliber unit, there are a few choices but we would recommend that you check out some of the other brands who are more focused on those with deeper pocketbooks. Frigidaire has been a big player in the wall oven industry for quite some time, and for good reason. They have a very large and diverse selection of products, many of which are very reasonably priced and should fall into just about everyone’s price range. Most of the standard and desired oven sizes, configurations, and power sources are included. Yes, there will be better-performing brands on the market and there can be a few notable quality issues, but this is more than a fair tradeoff for the great price and acceptable features and performance you get. 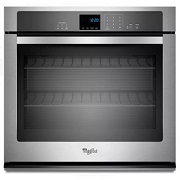 For anybody looking for a starter or mid-range wall oven, we definitely recommend checking out with Frigidaire has to offer. Power output is plenty for most, even in GE’s budget models. Specifically, in the bottom single units, you will find wattage of 2600W and 3400W for baking and broiling, respectively. This is bumped up to 2850W and 4300W if you go with a Café or Profile series and they also come with convection power of 2400W. As for the double wall ovens, this power levels remain the same except that you obviously have two ovens instead of one to use. 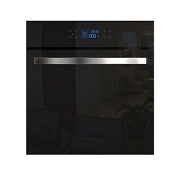 One unique product line that is specific to GE is their Advantium ovens. These products primarily utilize light instead of traditional heat coils or convection to heat food items. They come with an impressive 6300W of electrical input but only 1200W of boiler power. While this might seem like a step down from the other (typically cheaper) models, the Advantium technology does things completely different and you can’t directly compare the two like that. All of this equals out to great cooking performance. Specifically, you can expect items to finish when they are supposed to and regulating heat is very easy. There are also several built-in features in the higher-end models that do a good job of monitoring your food for you so that you don’t accidentally overcook it. We really like the features that are available in most of the GE models. Similar to other brands that have “tiers” of wall ovens, you will give up some of the features present in the high-end models if you decide to save some money and stick with a lower end model. However, all of your essential settings and features will still be present including things such as control lock capability, delay bake options, warm mode, etc. If you do spring for a Café or Profile series you will also enjoy some unique features such as multiple self-cleaning options, auto recipe conversion, hi/low/crisp broil, oven meat probe, and even wi-fi connection. Really the only options that are missing and that we would like to see our more customization options such as being able to create user profiles and storing particular cook times and length. One of GE’s biggest pros is in its product choices. As mentioned above, the options are vast and no matter what your budget, size, or performance requirements are you likely can find something that will work for you. We like that they offer different tiers that will come with varying features and that they apply each of these tiers their single, double, and combination wall oven configurations. In addition, they offer French door options for those who are really wanting to stand out from traditional wall ovens. Finally, GE has also created a totally new type of cooking approach in its Advantium wall ovens that utilize light as their main source of cooking food. And they have gas options for those who want to get away from the more popular electronic wall ovens. Overall we are very impressed with the products we can choose from. Due to the sheer number of products to choose from, there is quite a bit of variety in regards to how the various GE wall ovens look. Not only are there quite a few different color choices including white, black, stainless steel, and rust, but there are also many different styles to choose from. There are similarities in styling within each series, with the Profile series typically being considered the most attractive. For those who are on a tighter budget or simply don’t put that much weight into aesthetics, the general GE wall ovens have a very plain and modest look. We do wish that there was a more impressive digital screen to look at. Even in the highest-tier examples, the screen is somewhat small and boring. Probably the only user interface that really jumps out at us is the setup used in their CT9070SHSS Café Series French Door model as well as their Advantium lineup. We are overall very impressed with the build quality of GE wall ovens. Outside of a few sparse issues with the door rubbing a bit and being a little hard to open and close, there are no major issues with reliability or toughness. This is particularly the case in the higher-end models as they seem to be built with higher-quality materials and more time went into assembly and construction. However, even the budget lines should hold up to typical wear and tear for several years. And if there does happen to be an issue, GE has a very established and timely repair process that can assist you. These products tend to migrate to the mid-ranged price line but they do have outliers that will be on the lower end and also the upper end. This is mostly due to the sheer number of products to choose from. Because of this, there are a lot of different price ranges that will be met. We feel that the asking price is more than adequate given the high-quality manufacturing and acceptable performance that you receive with a GE wall oven. And for those who want some more features and are willing to spend a bit extra, GE will have you covered there as well. 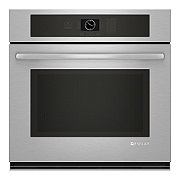 We are big fans of what GE brings to the table with their lines of wall ovens. They have a huge, diverse collection that will meet just about everybody’s needs and they also come in all of the desired configurations. They even go a bit further with their more exotic Advantium line which gives people a chance to experience a totally new type of heating element. While their budget models are somewhat bare-boned and modest in appearance, their premium lines are loaded with plenty of features and also look quite nice. We would definitely recommend that you add GE to your list of wall ovens to check out the next time you are in the market. Both Jenn-Air’s 27” and 30” wall ovens in both V2 vertical dual-fan convection and their multimode convection come with 2,800W bake element power and 4,000 broiler element power. Where the difference comes in is in the convection power. The multimode systems boast an impressive 3,400W convection power but Jenn-Air’s V2 vertical dual-fan convection system has an industry-leading 6,800W of convection power thanks to running two fans instead of one. This is an incredible amount of heating ability and it means that this oven can tackle just about anything you can throw at it. Their steam-based JBS7524BS model doesn’t boast quite as much raw power but it still can get the job done for those who prefer a steam hybrid system. All of the standard cooking modes are also present that help you to better control and harness all of this cooking power. There are some rather specialized features that you don’t find in many models including wi-fi connectivity, Jenn-air’s proprietary Culinary Center program which customizes each cooking cycle based on your personal preferences, auto-close door, halogen theater lighting, and one of our favorite features: the LC display. On the 30” model you enjoy a 7” touch display (the largest we have come across) and on the 27” you have a 43” menu-driven LCD display. Within this display is all of the buttons and features you can easily access. This also reduces the clutter of the face of the oven since you don’t have to have a ton of individual buttons. As for cooking features, there are a plethora of them. You really can customize each oven to your various preferences and make it really optimized for your cooking style and household needs. You can even change the settings from your phone! We are happy to report that Jenn-Air offers the three most popular configurations: single, double, and combination. One way that they stick out from the crowd is that they seem to have focused more on the double and combination ovens instead of singles. Since the majority of their products fall under these two categories, it must mean that they are confident in their ability to combine multiple units and have them work well together. We also like that there are different oven sizes and an impressive 3 different types of convection technology to choose from. The decision to make a convection/steam hybrid oven is also really cool and will attract those who prefer the unique benefits of a steam oven. Simply put, these are gorgeous wall ovens. They come in a sleek silver finish with a huge blacked out window or an all-black look. The metal is finished with a DuraFinish protection which not only helps to protect it but also protects the nice finish from yellowing, staining, or scratching. We also like that Jenn-Air uses halogen theater lighting inside the oven which really gives it a nice one and actually makes it easier to see your food when checking on it. Without a doubt, however, our favorite aesthetic feature is the huge LCD screen. This full-color screen gives a very “futuristic” and progressive look to the wall oven. Another added benefit is that it takes away the need to have to use knobs or buttons and instead all you see is a sleek black finish that will look great in any setting. Despite all of the complex features included on these wall ovens, they are surprisingly resilient. The materials that are used are top notch and manufacturing and assembly is not rushed. This results in a unit that should hold up to standard kitchen wear and tear for many years. The only bad part about having an oven that is essentially run by a touch screen is that if the touch screen has issues then the oven is essentially useless until it can be fixed (which is not cheap outside of warranty). Thankfully, we haven’t seen any major issues being reported. All of this cool “stuff” and great cooking performance doesn’t come cheap. Jenn-Air wall ovens are among the most expensive in the industry. For those on a limited budget, these units will simply be out of your price range. Even their single units of the lowest tier are still quite expensive. However, for those who are willing to spend more for the latest in cooking technology and want something that will literally “wow” your friends and family when they see it then the high price of admission may be worth it. Jenn-air wall ovens really do knock it out of the park in just about every category. They have a diverse enough range of products for most people’s needs. We like that they expanded their convection technology to three different types and also that they put a much higher priority on double and combination wall ovens. The features that they have are vast and the heating element power is among the highest in the industry. And they look fantastic to boot. The only major draw is the extremely high asking price that these products fetch. For those that can afford it and are willing to spend this kind of money then we highly recommend looking into a Jenn-air wall oven. There are several tiers of heat sources in varying Kitchenaid ovens. On the lower end, they have their traditional true convection oven that features 2,000W bake element power, 3,600W broiler element power, and 1,600W convection element power. This is then bumped up to 2,800W bake element power and 4,000W broiler element power in their Even-Heat lines. On the bottom tier, this is below average from what we are used to seeing in the price range but the Even-Heats put out average if not above average power. However, the real selling point for us is within the Even-Heat Technology itself. There are actually two different Even-Heat options to choose from: Bake/Broil and True Convection. In bake/broil, this technology delivers a more balanced baking and roasting experience by cycling the bake and broil elements constantly to help maintain a more even temperature. In True convection, a unique bow-tie design and optimized convection fan help to maximize consistency in temperature across the entire oven cavity. There are plenty of features available on Kitchenaid wall ovens, particularly in their higher-end models. We have already gone over their Even-Heat technology above, but this is just the beginning. Other nifty features include their FIT system which allows for customization of wall oven dimensions for a more flush installation, Even-Heat preheat which helps to remove cold spots, self-cleaning cycles to lower the require maintenance, optional SatinGlide Roll-Out Extension rack, and much more. The only element that is really missing from these units is a more robust user customization and recipe storage program that we have seen in some other models. But this is a minor complaint. No matter what size or configuration of a wall oven you are after, you should be able to find something that meets your needs here. There are not only single, double, and combination wall oven configurations but there are also several tiers within each. Variations include both oven size as well as heat sources, with many utilizing the helpful Even-Heat technology but others not offering this but at a noticeable drop in asking price. Really the only products that we feel are missing are non-electric ovens such as steam or gas. Anybody who prefers to go with a non-electric wall oven will be out of luck here. These are very sleek and attractive wall ovens as long as you are cool with mostly silver or black. There are a few white choices but they are limited to only certain models. That being said, the black and silver go together very nicely and give off a feeling of being a premium product. The glass-touch display is bright and easy to read and doesn’t feel cheap and gimmicky like it does in some other models. We are glad that Kitchenaid decided to go completely away from knobs and instead stuck to the flush finish of a complete touch screen. Kitchenaid has established itself across many categories as making reliable and tough products, and that is for the most part also the case here. The materials that they use are of high quality and we can’t find any major shortcuts in assembly or installation that would cause major problems. The one issue that we feel worth mentioning is something that we have heard multiple sources confirm. It has to do with the self-cleaning features on many of their products. Apparently, there have been cases where the self-clean mode actually resulted in the unit overheating and causing significant damage to it. We hope that Kitchenaid has looked into this and corrected any potential components that may cause this and we encourage you to contact them for further clarification for a better piece of mind. Asking prices for these will fall in the middle to premium-range. Even their “budget” line is well into the mid-range. This is pretty standard for most of Kitchenaid’s other products so we aren’t really surprised. Also, we feel that this price is more than acceptable given the good performance, features, and styling that these wall ovens possess. Specifically, we would encourage you to consider spending a bit extra and going for the higher-end models that come with the Even-Heat technology as we absolutely love that feature and think it is worth the higher asking price. Across the board, Kitchenaid delivers a wide variety of wall ovens that meet most of our check marks. While their lowest end ovens are a bit lacking in the performance department, their mid and upper-tier examples more than make up for it. We particularly like the Even-Heat technology that really makes cooking much easier. In addition, there are enough features to make just about everybody happy. Finally, the looks and durability meet high expectations as well. The only minor issue is the asking price but for what you get with a Kitchenaid wall oven it is more than reasonable. No matter which LG wall oven you go with you will have just about the same levels of performance. Specifically, you will enjoy 2,500W inner boiler and 1,500W outer broiler, and 2,500W bake element. This honestly is a bit disappointing to us as there are much more powerful units out there but LG is confident that it is plenty for most people’s needs. And as far as we can tell they are pretty spot-on about this. If you decide to spring for the LWS3010ST model you will also have an additional cooking feature called Crisp Convection which is advertised as being great for those who want to have extra crispy bread products while not burning them. The only issue we have seen with the convection feature is that the fan might be too loud for some people’s liking but having extra fan noise is simply the price of admission for many convection wall ovens. All the features you would expect to see in a wall oven of this price range are present as well as a few that we don’t always see. Standard features include things such as multiple cooking settings (healthier roast, convection roast, etc. ), self-cleaning, control lock capability, digital display, and more. However, where LG stands out from its competition some comes in some additional features that are found on its higher-end, Crisp Convection model. It comes with SmoothTouch controls which we really enjoy and it also comes with a gourmet recipe bank which we think is really cool. If you have read some of our other wall oven reviews on here you know how we constantly harp about the need for more customization, user settings, etc. so LG deciding to have a bank of recipes stored in the oven is really cool and a huge selling point to us. You only have 9 products to choose from, with many of them overlapping in similarities. You essentially have one wall oven volume work with: 4.7 cubic feet. While this should be enough for most people if you are a very passionate cook or have to entertain a large family or group of friends you might wish that there were some larger capacity options to go with. In addition, outside of the 30” door on the LWS3010ST, you are limited to the same door size as well. Thankfully, there is a bit of variety in aesthetics. You get to choose from the traditional LG wall ovens or the more visually-pleasing LG Studio series that come with a few extra features as well. 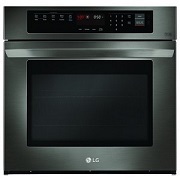 Another thing that is noticeably missing from LG’s lineup is combination wall ovens. Those who are looking for a product that incorporates a microwave into it will be out of luck. Also, those who want gas or steam-powered wall ovens will also have to look elsewhere. We have always felt that LG makes a strong case in the looks department for its price point in many other of its appliances and this is also the case here. The styling is clean, slick, and modern enough to look good in most households but still traditional enough to not make it looks like it is from the future for those who look to keep things traditional. In particular, LG does an excellent job with the LED display by including multiple colors (red, blue, white) in it. Most other brands stick with a single color which is fine but doesn’t really “pop” like these digital displays do. The buttons are also illuminated in a nice but not overly powerful white hue that will make it easy to identify them in poor lighting. For those who want something a little different, LG offers their Studio model which has been inspired by Nate Berkus, a famous interior designer. You get to enjoy a smudge-resistant finish on the attractive dark silver finish. Also, the buttons were replaced with traditional knobs. While this may be a turnoff to some, LG is able to do it in a way that gives this wall oven an extra level of sophistication. There are no major gripes with any of LG’s wall ovens. The digital display, which can be a major area of concern on many of these ovens, is rock solid here and should hold up to many years of use. The electrical panels are also of great quality and construction and we haven’t heard any horror stories of them going out or overheating when using the self-cleaning mode. Fit and finish is also on point and problems such as the door not properly closing or there being uneven edges is, for the most part, a non-issue. Other brands should take some notes because LG has figured this out! LG seems to go for a pretty standard price point with most of their products that place them comfortably in the middle to slightly premium price range. True to form, that is also the case here. You won’t find as noticeable of a difference in the asking price between the lowest-tier LG wall ovens and the highest-tier. We actually don’t mind this as it allows someone to have a lot more flexibility and choices for a given price point. It is somewhat pointless having a ton of various models if most of them are outside of your price point! While these prices might be a bit higher than some can or are willing to spend, you do get a product has good enough performance, features, and reliability to warrant it. Overall, LG wall ovens are a solid choice for anybody looking to set up a new kitchen or simply upgrade some older appliances. There aren’t a ton of product choices but for what is available you do enjoy a solid unit that can handle all but the most challenging of cooking tasks. All of the features you expect are there as well as some welcome additional ones such as the recipe database. And, most importantly, you are getting an oven that will last so that you make the most out of your large investment. Heat specifications for both the 27” and 30” models are 2,800W for the baking element, 3,600W for the broiler element, and 2,500W for the convection power. This is right in the middle in terms of performance compared to other brands. We have seen in other cases that this is plenty of power for most people’s needs and that as long as the rest of the oven is assembled well and provides a nice, insulated seal that cook times should be about what you expect them to be. 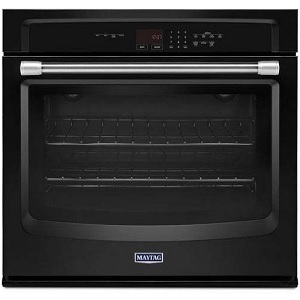 As mentioned above, no matter which Maytag wall oven you go with you will get to enjoy convection heating. We don’t see the huge list of performance features that we have seen in other models but we do appreciate the variable broiling that is included. Overall we are a bit disappointed with the list of features you get to choose from with these. Other ovens at similar price points have a lot more features to offer and we were hoping that we would have ab it more variety with Maytag’s. The only features of major note are the heavy-duty roll out racks and the adjustable frame that helps to ensure a more flush fit with the wall surrounding the oven. We really miss not having the wide variety of cooking settings and more advanced temperature monitoring accessories and functions that we have seen in other models. These are things that aren’t overly gimmicky and that people would actually use on a regular basis. You will probably be underwhelmed when you look at the total number of wall ovens that Maytag produces since it is only 5. However, for being such a small number, they are about as diverse selection as you can ask for. They have offerings in the three most popular configurations (single, double, and combination) and they even offer two popular oven sizes to choose from for the single and double. However, for those who are after a gas or steam oven or someone who prefers a more exotic layout you will be out of luck. The styling of these units is very safe but a proven look that won’t turn off many people. Color choices come in stainless steel, black, and white. We definitely prefer the stainless steel look and how it compliments the black window and touch screen and we suspect Maytag does as well seeing how all of their stock photos show this silver color. The digital display is also very average. While we are glad that they have got away from using bulky dials, the buttons that they use don’t give off the premium vibe that other brands do. And instead of having the lovely blue or green backlight behind them they are a simple painted white. Typically we are used to seeing Maytag bring to the table a solid lineup of reliable and durable parts. That is, for the most part, the case here but there are some noticeable exceptions that we have seen people document. In particular, there have been some complaints in regards to the baking element going out prematurely. Also, there are some minor electric gremlins that people have had to sort out. This is a bit surprising as these Maytag wall ovens don’t have overly complicated user interfaces with tons of electronic features. Beyond these outliers, however, you should get to enjoy a relatively reliable product. The asking prices for these are right at the average which is pretty typical of the price point Maytag tries to put itself in with its other products. Honestly, this feels like a pretty “average” wall oven so we can’t be too harsh on the asking price but we aren’t doing flips over it, either. The lineup of Maytag wall ovens do their intended task without too much excitement or controversy. They have pretty typical performance and looks but we wouldn’t mind a few more features. The variety of options to choose from is small but diverse and the reliability is what to be expected outside of a couple of issues to watch out for. A decent “middle of the road” wall oven but there are better (and worse) options out there for the price. In the traditional electric Smeg wall ovens, you will enjoy anywhere from 1,300W baking, 2,000W broil, and 3,000W convection in their Piano Design Aesthetic wall oven and this bumps up to 3,500W broil and 2,600W convection on their Classic Design wall ovens. The former is definitely on the lower side when compared to other brands and models but the latter is more in line with what we typically like to see. As for their steam models, you can expect power output of 2,700W. One really interesting and unique feature in regards to the performance aspect of these is in how they approach convection. Most other brands simply have a single convection fan but Smeg advertises that they utilize what they call “True European Double Convection” which goes with two fans that put out 1,3000W each instead of a single fan. There are also plenty of cooking modes (up to 10 in most models). We like the cooking modes mentioned above as well as the helpful touch control and self-cleaning modes. However, we have found that there aren’t quite as many features as you may see in other brands. Honestly, we don’t mind as having a multitude of buttons on the display panel would potentially clutter things and take away from the lovely aesthetic of these Smeg wall ovens (which we will discuss in greater detail below). Also, we have found that a vast majority of people rarely use all of the features that their oven has so unless you are after very particular features or accessories then you will likely never realize that you are missing out. You may be a bit underwhelmed when you first look at the selection of Smeg wall ovens to choose from. Specifically, they only have 14 not including their microwaves. However, for what they do offer it is some of the most diverse collection you will find. They include single ovens, double ovens, combination ovens, steam ovens, electric ovens, and even speed ovens. This is more of a range than many other brands that have 5x the quantity! We like that Smeg has tried to touch as long of a target audience as they can but we would like to see a few more products of each type. Potentially have some more variations in size and even color choices would be a welcome addition. One of Smeg’s biggest selling points is in their great looks. These are very progressive in design and really give off an almost future-like look. They come in really attractive brushed metal as well as windows that have a lovely black or blue/gray mirror sheen. Also, instead of opting for busy and large displays that are loaded with gauges and buttons, Smeg has decided to instead keep things simple by keeping the face very flush and minimizing how many protruding buttons and knobs there are. Not having as intuitive of an interface as other brands might be a turn off to some but we really like it and find it to be refreshing on what can be a somewhat cluttered and mundane aesthetic wall oven market. We don’t have any major qualms with the build quality of these products. They seem to last to typical wear and tear and we haven’t heard any significant issues associated with them. This is another case where keeping things simple pay off since there are fewer areas that things can go wrong at. Asking prices are about average compared to the rest of the market. We are a bit torn on how we feel about this price point. From a performance and feature aspect, Smeg wall ovens are often lagging a bit behind other similarly-priced units in the industry. However, the looks and durability of these give off a vibe of a wall oven that costs twice as much if not more. So what it really boils down to is what is important for you in your next wall oven. Depending on what that may be, these may be a bit too much or they might look like a great deal. Smeg wall ovens bring a refreshing and unique twist to the industry with their very progressively designed units. The small but diverse product lineup should meet the requirements of just about everybody. However, the cooking times may be a bit lower than what you had hoped for. Also, for those who scope out products that are loaded with features you may come off a bit disappointed as well. 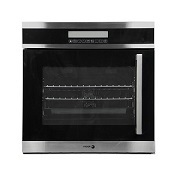 However, for those who are after an attractive wall oven that will hold up to use then look no further. As mentioned above, depending on what you are specifically looking for these may come off as being a great buy or they may come off as being a bit overpriced for what you get. The Summit line is pretty straightforward with their power sources, with you really only having two primary choices including their 220V electric ovens and their 18,000 BTU gas ovens. These are a bit smaller than what many other brands offer but for the price and sizes of these units, it is still acceptable. The construction of the cavity is acceptable and retains heat quite well which means that you don’t have to worry about a lot of heat escaping which lowers cook time and also your energy/gas bill. In regards to specific cook times, you can expect them to be about average so simply following recipe directions and their time estimates is recommended. One thing you may quickly notice that is missing from most of Summit’s wall ovens is convection capability. In fact, according to their site, the only product that they even offer that utilizes convection is their CMV24 speed-oven! We really enjoy the added efficiency and performance that convection brings to the table so we are a bit disappointed that Summit didn’t decide to include it more in their wall oven lineup. You won’t find a ton of features on these products. This is likely because they are targeted as being for the budget-minded who won’t have the requirement of having all of those extra features. The display is a simple clock with no LED interactive screen and the knobs are a traditional mechanical type. 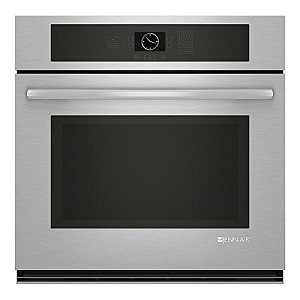 You will be disappointed if you are hoping to find a Summit wall oven that has more advanced features such as cooking settings, temperature probes, and other advanced monitoring accessories, etc. In other words, these are bare-bones that only focus on making a product that can cook food in a straightforward manner. The choice of Summit wall ovens is quite lacking. You only have the single-oven configuration to choose from. And even with this lineup, most of the models are extremely similar outside of their color and whether they are gas or electric. Outside of their speed oven, there simply isn’t much variance. We understand that in regards to making products for a tight budget, the single wall oven is obviously the best choice but we do wish that Summit would branch out a bit more. These are very plain-looking products that honestly look rather aged. The lack of having a bright and sharp LED display screen and also utilizing knobs that resemble what you would find on a wall oven from the 1980s gives these units a very rustic and mundane look. Again, for those who are on a tight kitchen budget, looks won’t play a bit part but we feel that this will stand out in a kitchen (in a negative way) if the rest of your kitchen appliances have a more progressive design. These wall ovens are actually well-constructed. The fact that they are so simple in design means that they are far fewer places where things could go wrong. And not having tons of electronics means that you don’t have to deal with electronic issues that can be prevalent in other products. We haven’t heard any major complaints from users other than those who are a bit surprised by the unique size of the Summit wall ovens. This is where Summit really shines. By forgoing all of the fancy features, the powerful oven, and the high-end aesthetic materials, you are left with an extremely affordable product. This is the target audience of Summit, and they definitely offer up an oven that does work at a very competitive price that most other brands simply can’t compete with. If you are trying to spend an absolute minimum on kitchen appliances then Summit presents a good argument to check them out. Summit wall ovens aren’t fancy and they don’t do any one thing particularly well. Their power output is lackluster, their features are essentially non-existent, the choices in oven configurations is small, and their aesthetics are very plain. However, they do the most important requirement of an oven which is to cook things properly and they do it at an extremely affordable cost. In addition, they are able to package this in a simple design that is surprisingly resilient to standard wear and tear and should last much longer than you would expect from a budget lineup. If you are simply wanting something that works that will have a minimal impact on your wallet then definitely check out what Summit has to offer. Oven heating performance on Thermador’s 27” and 30” Masterpiece Series wall ovens are as follows: 2,000W baking, 3,600W broiling, and 2,000W convection. For their Professional Series, these values are kept the same for baking and convection and bumped up to an impressive 5,000W for broiling. Outside of the broiling value for the Professional Series you might initially be wondering why these values are relatively “average” compared to the much cheaper options on the market. The answer comes in the huge range of other features and accessories that allow Thermador wall ovens to perform very well without having to increase their heating power. In their Masterpiece Series this includes things such as extremely fast preheat, true convection in all units, no preheat required, advanced temperature probes, 14 cooking modes, advanced culinary modes, and much more. In their Professional Series you also get to enjoy additional performance adders such as Maxbroil technology, a commercial style rotisserie, and more. Thermador’s steam ovens utilize 1,960W for both convection and steam. Since there aren’t very many steam and convection combination ovens on the market we don’t have a lot to compare to but this seems to be quite powerful. We are simply blown away by the sheer number of features that these wall ovens have. We went over a few of the ones directly related to cooking above but the list goes on. 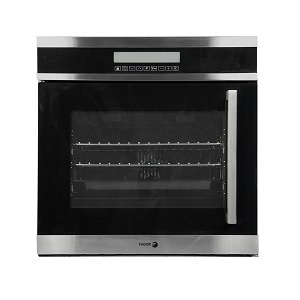 These include things such as their trademarked SoftClose door, an extremely fast 2-hour clean mode, Full Access telescopic rack for easy access, CookControl temperature probe, an oversized oven door window, hidden bake element, 6 adjustable rack levels (seven in the professional model), and the list goes on. In other words, there are more features on these units than we know what to do with! You can really see your investment at work with just how many things there are to learn. Honestly, we doubt most people will ever need or even want all of these options but it is reassuring to us to know that Thermador is constantly looking for ways to improve their product. We are overall content with the number of ovens to choose from. These most popular types are covered, including single, double, and combination. In addition, there are two different oven sizes within each type (27” and 30”). We have found that producing these three types of ovens cover at least 90% of what people are looking to buy. Furthermore, Thermador offers a Professional Series that bump everything up a notch and maximizes performance for those looking for something for commercial or industrial applications. This would have been acceptable to end here, but they also offer a couple of very unique products. First, they have a few different steam/convection combination ovens. When we say combination we mean that it is all contained in a single oven! This is really cool and something that we don’t see very often. Arguably even rarer is their triple combination ovens which combine an oven, a convection microwave, and a warming drawer. In this case, there are three different units all combined but it is still really unique. Really the only thing that is missing are products for those who are wanting a gas unit or that are on a tight budget. These are very attractive and progressively designed wall ovens. They come in a very clean stainless steel body that has modern angular curves that will make it look right at home in a high-end kitchen. We also like the premium oversized glass pieces that they use for the windows. In addition, the LED display is one of our favorite in the industry. It is enormous and all of the buttons are built in flush and are illuminated with an attractive blue hue. You definitely know you are looking at a premium-tier product when you look at a Thermador wall oven. This is where things go south very quickly. One problem that we see quite often with wall ovens that are loaded with features and electrics is that it significantly impacts their reliability. That is exactly the case here. There are quite a few noticeable and well-established quality control problems with these units. Many of them are centered around the electronic control board going haywire. This can do things such as randomly cause the broiler to come on, cause the digital displays to go out, and make random error codes pop up that can stop you from being able to properly use your product. In addition, the self-cleaning feature has been known to cause overheating issues and potentially damage the inner walls of the oven. Furthermore, the microwave on the combination ovens can also interfere with wifi. And the list goes on. For being such a high-quality set of products all around, we are very disappointed with how many reliability issues these have. Thermador wall ovens are among the most expensive ovens in the industry. There are only a handful of other companies that approach the asking price of these. When you pay this kind of premium you should only expect the best. And in many ways, you do get some of the best. However, the big glaring issue lies with reliability. Thermador brings some interesting products to the discussion. While they don’t have the most products to choose from, what they do offer is very diverse and they give us some very unique configurations that you can’t find anywhere else. We are very impressed with the cooking performance and in particular with the huge number of features that you get to enjoy. And the styling is on point as well. Our one complaint (and it is a HUGE one) lies with the durability. For the price, you have to pay for one of these the last thing you want to do is have to deal with expensive repairs or not being able to fully enjoy your investment. Thermador wall ovens would be a grand slam across the board if they could fix this but until then we can’t give our full support of them. There is a lot of variance to the cooking elements used in each Verona wall oven. The 30” (their largest) is powered by a 3,500W broiler element, 3,000W oven element, and 2 x 1,300W convection elements (for a total of 2,600W). 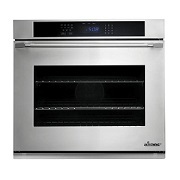 Their slightly smaller 30 x 24 models have 3,100W, 2,400W, and 2,500W for broiler, oven, and convection, respectively. If you keep going down the list, their much smaller 24” works with 2,000W, 2,300W, and 2,000W. They also have their gas unit that produces 7,000 BTU broiler and 11,000 BTU oven and the 110-volt electric oven that manages 1,800W on both broiler and oven. So what does all of that mean? The higher-end models such as the 30” and even the 30”x24” have competitive numbers that are average if not slightly above average compared to the rest of the industry. Their smaller sizes, however, are a bit weak for our standards. That being said, it isn’t fair to directly compare the 110V to a “typical” electric oven. We like that nearly every model comes with a convection option which we have seen in the past allows for very consistent cooking with a lot less initial power requirement. There aren’t nearly as many features on these Verona units as we have seen on comparably priced products in the industry. The main features include the built-in cooking modes which vary from 1 to 12, pyrolytic self-clean mode, dual convection fans, optional meat probe, and gliding rack. What is noticeably missing are the more advanced user customization settings, the ability to store recipes and cooking settings, and many of the specialized cooking features that other brands in the mid to premium-price tier add to their wall ovens. However, all of the essentials are there so those of you who rarely mess with some of the more advanced features probably won’t miss not having them. 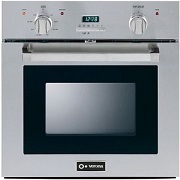 There are two distinct ways to look at the product selection that Verona offers in their wall ovens. On the negative end, there are only 7 products and all but one of them are single wall ovens. There really aren’t any tiers of classes for a given size nor any sort of combination wall oven. On the positive side, their single wall oven selection is quite diverse, including multiple power levels, sizes, and even an option for gas and 110-volt power. If you have your mind made on a single wall oven then there are a few options to look at but for everyone else, you might not find what you are really looking for. These are pretty average-looking units and don’t really have much to get excited over. The digital displays are very simple and old-fashioned and might look a bit rustic next to more progressively designed kitchen appliances. Also, Verona has decided to stick with bulky knobs on all of its products. While there is nothing inherently wrong with using knobs over buttons, we do wish that they would offer up some different designs as those who prefer a more modern look may be disappointed. 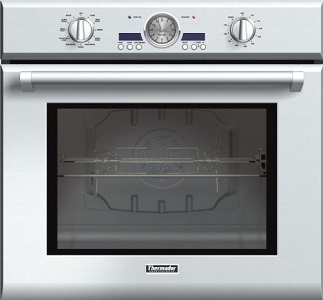 The oven body itself comes in a standard and safe brushed silver look. Verona harps as being inspired by Italian design and we do wonder what that comes into play with these products. These units are mostly acceptable in regards to their durability. Since they are relatively simple and don’t have a lot of electrical gadgets and gizmos as some of the competition there are fewer areas that things can go awry specifically with electronics. However, the metal pieces used are a bit on the thinner and lightweight side. While this doesn’t automatically equal being a less durable product, we have seen in other tests that over time a lighter material will often fail early. But until we have more established proof of that it is only speculation. The only other issue worth mentioning is that there have been reports of gaskets that seal the oven door and the oven coming off prematurely but again we haven’t personally dealt with that and are only going off of reports. Verona wall ovens play a safe approach here and don’t really give us anything new. There are a lot of options for single wall ovens but beyond that, you are limited in selection. Performance is about average and the list of features to work with is about average as well. We aren’t really inspired by the looks, either. If you are after a budget single wall oven then consider checking these out but for most other people there are better options out there. Viking actually doesn’t display their specific power output but we know that it is plenty of power for most people’s needs. Where Viking wall ovens really shine is in their huge array of performance features that make the most of the elements that they use. As expected, convection heating comes standard in all of their wall ovens. Specifically, you get to enjoy Viking’s trademarked Vari-Speed Dual Flow convection as well as their TruConvec. The Vari-Speed Dual Flow helps to maximize airflow by allowing the two convection fans to turn in both directions. TruConvec refers to the proprietary air circulation system that is in place. Other helpful additions include a 10-pass broiler with a heat reflector and in the 5 and 7-series you also have the choice of using the Gourmet-Glo Infrared Broiler. We have already gone over some of Viking’s features related to cooking performance but that only scratches the surface. They have a ton of other features that assist in ease of use as well as customization. Examples of this include Rapid Ready Preheat which provides one of the fastest preheat times in the industry, 6 rack positions with TruGlide full extension technology, internal halogen lighting for easy viewing, long-term cooking timer of up to 24 hours, self-cleaning ability, and much more. Really the only thing that is missing is a recipe or setting database that a handful of the other highest-tier wall ovens offer. But for most people, they should be more than content with the features that are already present. There are an acceptable number of products to choose from in the Viking wall oven lineup. You have both single and double configurations and there are three levels within each type that come with different tiers of features and performance. There are also gas options for those who don’t want to go with or are unable to go with a traditional electric wall oven. Another way that Viking really stands out is in their door layouts. They have the standard door that opens downward as well as options for their French doors in both double and single configurations. About the only thing that is missing is combination wall ovens that include a microwave or some other type of specialized oven and, obviously, those on a tight budget won’t find anything that is affordable. Viking have a very “tough” look thanks to their huge, thick walls and sturdy features. They proudly display their large knobs and this has become sort of a Viking staple. The only thing that you will notice about Viking wall ovens compared to other similarly-priced ovens is the simplicity in their display. They don’t come with the fancy electric LCD touch screen that other brands have. Instead, they stick with a simple timer and push buttons. We personally prefer the more progressive link of the LCD touch screens but this is a personal choice and for those who like the more traditional look this might be more appealing to you. Also, we love the French-door designs and someone who goes with one of these will have a truly unique look (but be prepared to pay handsomely for it). Viking products are known for their toughness and durability and that is also the case here. By only using high-quality metal components and not taking shortcuts in the assembly process, the result is a rock-solid unit that should last for years. And the fact that they don’t utilize the elaborate digital displays or have loads of fancy electrical features means that there is no concern about malfunctions which is a common issue with other brands. The self-cleaning options is also well sorted and you shouldn’t have to worry about potential damage from overheating which can be a nightmare in other models as well. Viking wall ovens are among the most expensive in the industry. Part of that definitely has to do with the “status” that they convey so you do pay a premium for the name alone. But beyond that, you do get a solid product that has plenty of features and cooking performance to match. But for many, this kind of money simply isn’t realistic to spend on a kitchen appliance. Viking wall ovens stick to their tried and true approach of making high-quality parts that have everything you would need in an appliance and fetching a high premium for it. Great cooking performance, plenty of features and accessories, and quality materials and construction make these units more of an investment than a purchase. You also get to enjoy the storied status symbol of owning a Viking product. But is it worth the extremely high barrier to entry? In our opinion, there are ovens that perform as well and come with even more features. We also prefer the visual looks of some other (more affordable) brands as well. But we can’t deny that you will enjoy a well sorted out wall oven if you do open your pocketbook for a Viking. There really isn’t a lot of variance between the heating outputs of the various Whirlpool wall ovens. Just about all of them come with Whirlpool’s standard 2800W bake element and 3600W boiler element. Compared to the rest of the field, this is right at average. The one area that Whirlpool does have some variance is in their convection capabilities. 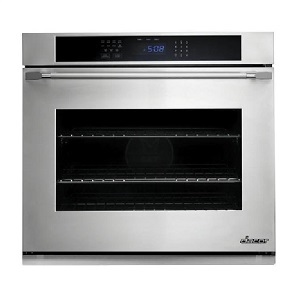 They offer ovens of similar sizes that come with convection and others that leave out the convection feature. As we have made fairly obvious up to this point, we really enjoy the added convenience and performance of convection but understand that there is a bit of an upcharge for including it. Beyond that, there are a few other features in the higher-end models that we appreciate and that do add to the overall cooking performance of these Whirlpool wall ovens. Examples of these include the AccuBake temperature management system which helps to accurately cook food thanks to the use of built-in sensors. In addition, we like the rapid preheat option which preheats the oven 25% faster than conventional ovens which save both time and energy. From a features standpoint, Whirlpool wall ovens offer up all of the important features you typically look for as well as add a few extra on their higher-end models. As mentioned above, they have some helpful cooking management systems in place that improve the overall ease and performance from a cooking standpoint but it doesn’t just stop there. They also have other neat inclusions such as their SteamClean option which makes clean up much easier, their Precise Clean system which optimizes cleaning cycles, and their FIT system that helps to fit their wall oven seamlessly into your current cabinet cutout. However, they don’t offer much in regards to customized user control or preconfigured cooking settings. Overall, we would say that Whirlpool gives us an average to slightly above average levels of features when compared to the competition. We would like to see them include more customization options in the future. All of the primary product lines are there including single, double, and combination wall ovens. However, you won’t find as diverse of a product range as many other large competitors on the market. There are only two tiers and all of their products are electrical-based so for those of you who prefer steam or gas you will be out of luck. Thankfully, they do offer both convection and non-convection ovens. As for colors, you typically have three to choose from: white, black, and brushed stainless. This also is pretty standard for most brands. The one area we really feel that Whirlpool is lacking is in having a premiere lineup that really stands out from the rest of their offerings. Both of their lineups are very similar in regards to performance and features. In fact, they have the same heating output! In our opinion, Whirlpool needs to bump things up a notch and bring out a few products that really push the envelope and stand out from the rest of their product lineup. Visually, Whirlpool wall ovens look quite nice. No matter what color you choose, it comes in a very sleek, modern look with nice accents that really set it off. The user interface is more than acceptable and we are glad that Whirlpool go away from the bulky knobs that many other brands use and instead went with buttons. The LED screen could be a little more impressive but it does the job for the most part. Probably our favorite feature is the number touchpad that resembles something that you would see on a cell phone. Since most people will be very familiar with its layout it makes for much easier user experience. Whirlpool is known for selling quality, proven products and this is no different here. You get a well-engineered and constructed wall oven that should hold up to typical wear and tear for many years. There really aren’t any major shortcuts in material or assembly. Our only minor complaint is that the fan can be somewhat loud and we assume this is due to being a little unbalanced or rubbing somewhere. This added friction and vibration from the fan could shorten its lifespan and ultimately impact performance. If your fan is making a loud noise we encourage you to call up Whirlpool and get a tech out to look at it while it is under warranty. Whirlpool wall ovens fall squarely in the mid-range of prices. We have seen this approach used by Whirlpool on many of its other products as well. It seems like they want to attract people who aren’t wanting to spend a fortune on appliances but are willing to spend a bit extra for something that performs well and looks good. You will see a slight up-charge if you go with their higher end Gold models but for the most part, both product lines are very similarly priced. Overall, Whirlpool does a pretty good job of bringing a solid lineup of wall ovens to the table. While they won’t be breaking any records in cooking performance or in their list of features, they do what they are intended to do without any major complaints. There is a large enough selection of products to meet most people’s needs and they also keep the asking price in check so that most people can still fit it into their budget. We also like the nice styling that went into the design. 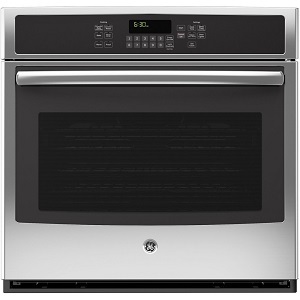 For those who are looking for a mid-ranged wall oven, we think you should give Whirlpool wall ovens a look. What are the Different Types of Wall Ovens? There are actually quite a few different types of wall ovens to choose from. Each type has its own unique pros and cons. When first looking at everything out there it is easy to become overwhelmed. But fear not! We are here to help. 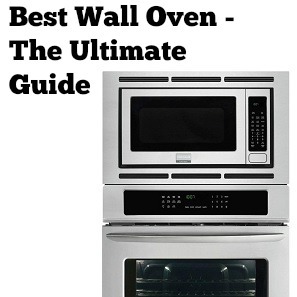 We have listed most of the popular types of wall ovens below for your convenience. Although not entirely conclusive, there are five primary types of wall ovens we deal with: electric, gas, steam, microwave, and light. Electric wall ovens are by far the most popular form. “Electric” is a rather broad term since, obviously, nearly every other oven type requires electricity to run. Rather, we are specifically referring to the heat elements that are used. They are typically coils that are powered by electricity similar to what you would see in a standard heat lamp. This is thanks to a coil, strip, or wire that has electric current flowing through it which makes it glow hot and convert the passing energy into a radiant heat. The exact form of electricity can vary. Most wall ovens are designed to utilize a standard 240V outlet that is common in a home but there are specialty electric wall ovens that can handle different outlets that you might find in cabins, RVs, etc. 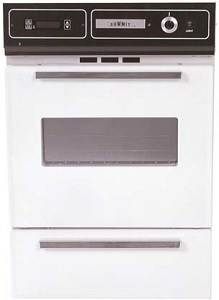 The second most common type of wall oven is a gas wall oven. These are intended for households that have or prefer the usage of natural gas over electricity for their cooking appliances. There are also some wall ovens that are designed for propane hookups for RVs and campers but these are much less common. There are some slight benefits to using gas over most electric wall ovens including faster heat-up times and the ability to provide moisture heat which some believe will improve the juiciness of a cooked meat but we feel it really comes down to personal preference. Steam wall ovens are rather unique in that they utilize steam as their form of heat instead of electricity or gas. The main selling point with steam ovens is that they are believed to retain very hight levels of moisture which allows for more much juicier meats and better baked bread. They are a bit more work, however. You are expected to refill the unit with water to create the steam (or some units will have a direct water line similar to what you would find on your washing machine). The other con is that cooking and heating times can be longer than with other types of wall ovens. Another cool feature is that some products even combine steam with convection to make a sort of “steam hybrid” setup. This helps to reduce cook times and also ensures a more consistent temperature throughout the oven. cooking. Brands such as Jenn-Air have made a name for themselves with this type of wall oven. Essentially, you get to enjoy the speed and convenience of a microwave without the soggy effects that a standard microwave seems to have on most items you put in it. This is primarily used in GE’s Advantium line. It is a very new technology that combines the effectiveness of a standard convection oven with the radiant heat products by halogen bulbs which gives your food a microwave boost. The end result is food that is cooked extremely quickly while steel keeping in most of its moisture. You have probably heard us talk about single, double, and combination wall ovens. But what is the difference between each? We give a concise description of each below. Single wall ovens are the most common and most affordable of all wall oven types. It only consists of a single oven with no additional cooking element or volume. These are great for people who are very limited on space and/or cash and simply want something that can cook a small meal. For those trying to feed a larger household, however, you may find that you quickly run out of space when using just a single wall oven. Double wall ovens are a step up from single and consist of two (typically identical) ovens stacked on top of each other. This essentially doubles the cooking volume that you have available but also allows you to individually monitor and adjust settings such as temperatures, timers, etc. for each oven. While obviously more expensive, these are a must for those who plan to do a lot of cooking. They also look quite nice. Combination wall ovens are a bit broader. As the name suggests, they are any oven that has a combination of cooking sources that are combined into a single piece. Probably the most common is an oven/microwave combination. However, there are many other types including examples that include speed ovens, steam ovens, and other types and sizes of convection ovens. Some of the larger models even come with two ovens on top of a microwave which makes for the ultimate cooking center. Typically, combination wall ovens will be some of the most expensive products on the market depending on what type of combination you are looking at getting. 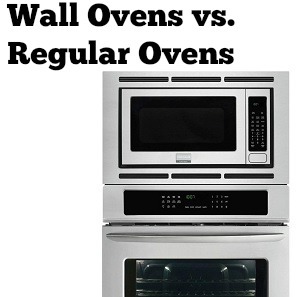 Another question you may be asking yourself is what exactly is the difference between a wall oven and a “regular” oven? Well, the answer is more simple than you might think and is pretty literal. A wall oven is designed to be inside a wall and will not contain a top cooking stove. A regular oven will be a combination of both a stove and an oven. Both have their own unique places in a kitchen. A wall oven is great for places where you don’t have room for a counter or prefer the flush look of a row of cabinets. It can also be good as a backup option for those times when your other oven is being used for other foods. However, you are limited in your cooking methods. A regular oven is essential for those times you prefer or need to utilize pots and pans or stir the food. They also help to maximize more space since you have two cooking elements so close to each other (the top stove and the bottom oven). But at the same time, they do require more planning since you will need to have easily-accessed countertop area available so as to fit the top part of the oven. We feel both a wall oven and a regular oven are essential for anybody looking to complete a kitchen that can handle anything you can throw at it! 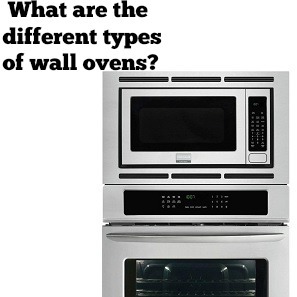 1.5 What are the Different Types of Wall Ovens?